Providing you the best range of anti radiation patch with effective & timely delivery. Leveraging upon our technologically-advanced production facility we provide an excellent quality Anti Radiation Patch. Clean Mobile Phone, Remove the Paper from the anti-radiation chip, Fix Anti-radiation chip on the back side of phone close to the antenna. 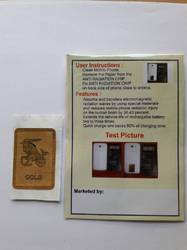 Absorbs and transfers electromagnetic radiation waves by using special materials and radiation mobile phone radiation injury on the human brain by 96.43 percent. Extends the service life of rechargeable battery two to three times. Quick charge and save 50% of charging time.